Cython* is a superset of Python* that additionally supports C functions and C types on variable and class attributes. Cython is used for wrapping external C libraries that speed up the execution of a Python program. Cython generates C extension modules, which are used by the main Python program using the importstatement. One interesting feature of Cython is that it supports native parallelism (see the cython.parallelmodule). The cython.parallel.prange function can be used for parallel loops; thus one can take advantage of Intel® Many Integrated Core Architecture (Intel® MIC Architecture) using the thread parallelism in Python. Intel® Distribution for Python* 2017 is a binary distribution of Python interpreter, which accelerates core Python packages, including NumPy, SciPy, Jupyter, matplotlib, Cython, and so on. The package integrates Intel® Math Kernel Library (Intel® MKL), Intel® Data Analytics Acceleration Library (Intel® DAAL), pyDAAL, Intel® MPI Library and Intel® Threading Building Blocks (Intel® TBB). For more information on these packages, please refer to the Release Notes. The Intel Distribution for Python 2017 can be downloaded here. It is available for free for Python 2.7.x and 3.5.x on OS X*, Windows* 7 and later, and Linux*. 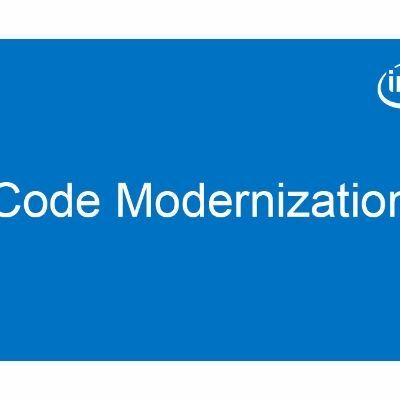 The package can be installed as a standalone or with theIntel® Parallel Studio XE 2017. Intel Distribution for Python supports both Python 2 and Python 3. There are two separate packages available in the Intel Distribution for Python: Python 2.7 and Python 3.5. In this article, the Intel® Distribution for Python 2.7 on Linux (l_python27_pu_2017.0.035.tgz) is installed on a 1.4 GHz, 68-core Intel® Xeon Phi™ processor 7250 with four hardware threads per core (a total of 272 hardware threads). In Python, there is a mutex that prevents multiple native threads from executing bycodes at the same time. Because of this, threads in Python cannot run in parallel. This section explores thread parallelism in Cython. This functionality is then imported to the Python code as an extension module allowing the Python code to utilize all the cores and threads of the hardware underneath. To generate an extension module, one can write Cython code (file with extension .pyx). The .pyx file is then compiled by the Cython compiler to convert it into efficient C code (file with extension .c). The .c file is in turn compiled and linked by a C/C++ compiler to generate a shared library (.so file). The shared library can be imported in Python as a module. In the following multithreads.pyx file, the function serial_loop computes log(a)*log(b) for each entry in the A and B arrays and stores the result in the C array. The log function is imported from the C math library. The NumPy module, the high-performance scientific computation and data analysis package, is used in order to vectorize operations on A and B arrays. Similarly, the function parallel_loop performs the same computation using OpenMP* threads to execute the computation in the body loop. Instead of using range, prange (parallel range) is used to allow multiple threads executed in parallel. prange is a function of the cython.parallel module and can be used for parallel loops. When this function is called, OpenMP starts a thread pool and distributes the work among the threads. Note that the prange function can be used only when the Global Interpreter Lock (GIL) is released by putting the loop in a nogil context (the GIL global variable prevents multiple threads to run concurrently). With wraparound(False), Cython never checks for negative indices; withboundscheck(False), Cython doesn’t do bound check on the arrays. After completing the Cython code, the Cython compiler converts it to a C code extension file. This can be done by a disutilssetup.py file (disutils is used to distribute Python modules). To use the OpenMP support, one must tell the compiler to enable OpenMP by providing the flag –fopenmp in a compile argument and link argument in the setup.py file as shown below. The setup.py file invokes the setuptools build process that generates the extension modules. By default, this setup.py uses GNU GCC* to compile the C code of the Python extension. In addition, we add –O0 compile flags (disable all optimizations) to create a baseline measurement. This generates the multithreads.c file, which contains the Python extension code. You can compile the extension code with the gcc compiler to generate the shared object multithreads.so file. After the shared object is generated. Python code can import this module to take advantage of thread parallelism. The following section will show how one can improve its performance. You can import the timeit module to measure the execution time of a Python function. Note that by default,timeit runs the measured function 1,000,000 times. Set the number of execution times to 100 in the following examples for a shorter execution time. Basically, timeit.Timer () imports themultithreads module and measures the time spent by the function multithreads.test_serial(). The argument number=100 tells the Python interpreter to perform the run 100 times. Thus,t1.timeit(number=100) measures the time to execute the serial loop (only one thread performs the loop) 100 times. Similarly, t12.timeit(number=100) measures the time when executing the parallel loop (multiple threads perform the computation in parallel) 100 times. Measure the serial loop with gcc compiler, compiler option –O0 (disabled all optimizations). Intel(R) Distribution for Python is brought to you by Intel Corporation. Import timeit and time t1 to measure the time spent in the serial loop. Note that you built with gcccompiler and disabled all optimizations. The result is displayed in seconds. Measure the parallel loop with gcc compiler, compiler option –O0 (disabled all optimizations). The parallel loop is measured by t2 (again, you built with gcc compiler and disabled all optimizations). As you observe, the parallel loop improves the performance by roughly a factor of 110x. Measure the parallel loop with icc compiler, compiler option –O0 (disabled all optimizations). 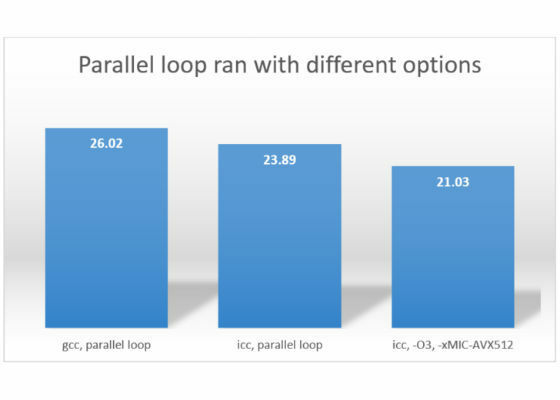 Measure the parallel loop with icc compiler, compiler option –O3. The result shows that the best result (21.03 seconds) is obtained when you compile the parallel loop with the Intel compiler, and enable auto-vectorization (-O3) combined with Intel AVX-512 ISA (-xMIC-AVX512) for the Intel Xeon Phi processor. an environment variable to accomplish this. This article showed how to use Cython to build an extension module for Python in order to take advantage of multithread support for the Intel Xeon Phi processor. It shows how to use the setup script to build a shared library. The parallel loop performance can be improved by trying different compiler options in the setup script. 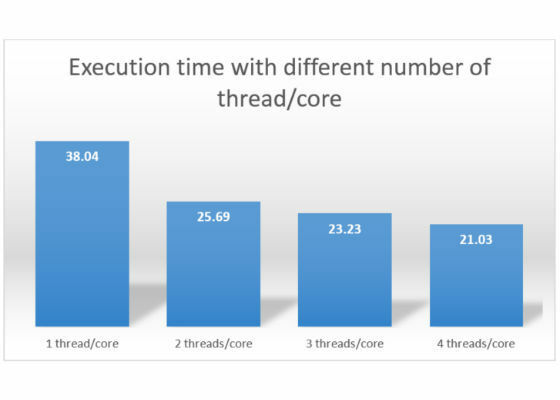 This article also showed how to set different number of threads per core. What exactly the difference between them?